NASA officials admitted Thursday the agency's proposed fiscal 2013 planetary science budget is insufficient to accomplish most of its top objectives in the coming decade, canceling the start of a Mars sample return campaign, deferring flagship probes to the outer planets and delaying the launch of smaller Discovery-class explorer missions. President Barack Obama's budget proposal for the next fiscal year, which begins Oct. 1, would drop NASA's planetary budget to less than $1.2 billion, a $309 million cut from the current year. "This budget does not provide any funds for a flagship-level activity," said Jim Green, director of NASA's planetary science division. "So that would mean we would need a new start. That would mean we would need the approval of the administration. That would mean we would need the approval of Congress. That would mean the economy would have to really rebound." NASA Administrator Charles Bolden, speaking Feb. 13, urged scientists, employees and the public to appreciate two flagship missions yet to accomplish their missions. They are the $2.5 billion Mars Science Laboratory, a nuclear-powered rover now en route to the red planet, and the $8.8 billion James Webb Space Telescope, the successor to the Hubble observatory due for launch in October 2018. "Let's be patient," Bolden said. "Let's eat this pie that we have. Let's nibble on the two flagships that we're trying to work before we bite off another one." NASA's overall budget budget would be $17.7 billion under the Obama administration's spending plan, a slight reduction from 2012 levels. Budget officials restructured NASA's funding to pay for JWST, an infrared telescope designed to resolve the oldest galaxies in the universe, study the life-cycle of stars, and characterize planets outside the solar system. Green presented the budget to the planetary science subcommittee of the NASA Advisory Council on Thursday, the first time the research community has been able to respond directly to the space agency's funding blueprint since it was announced last week. The budget request, which can be altered by Congress, is forcing NASA to rethink its planetary exploration strategy and compelling a partnership between the agency's scientific and human spaceflight divisions. NASA is pulling out of a partnership with the European Space Agency on two robotic Mars missions slated to launch in 2016 and 2018. 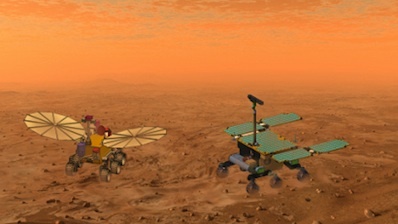 The space agencies were developing a methane-sniffing orbiter and a rover to cache rock samples, which would be retrieved on a later mission and returned to Earth. The U.S. contribution to the Mars missions, which included instruments, launch vehicles and an entry, descent and landing system, was the top flagship scientific priority in the solar system identified by an independent panel of planetary scientists in 2011. The planetary decadal survey, sponsored by the National Research Council, convenes every 10 years to rank the value of NASA's solar system missions. The space agency's policy is to follow the decadal survey recommendations when crafting a science program for the next decade. Last year's decadal survey report covered the years between 2013 and 2022. Instead of embarking on the joint program with Europe, NASA is mulling a new Mars exploration strategy, soliciting significant inputs for the first time from the agency's human spacefight directorate and technology office. A less costly, narrowly-focused Mars mission may be ready to launch by 2018, according to John Grunsfeld, the chief of NASA's science programs. But according to the decadal survey report, if NASA deemed the flagship-class Mars rover unaffordable for launch in 2018, the space agency's next priority is a mission to orbit Jupiter's icy moon Europa. Estimated to cost $4.7 billion, the mission was deemed to expensive for all but the most generous planetary budgets. NASA's statements about resuming Mars missions later this decade irked some scientists promoting voyages to the outer planets, who said that if the flagship Mars rover was canceled, the decadal survey explicitly prioritized a Europa mission over other, less-ambitious Mars projects. 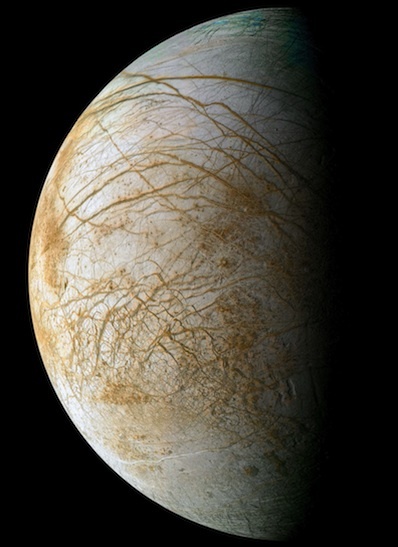 A mission to closely observe Europa has been on scientists' wish list for more than a decade. The outer planets community is evaluating three options to "descope" the Europa mission, stripping some of its ambitious science goals to fit in a tighter budget. Study teams are considering a Europa orbiter emphasizing the moon's internal structure and oceans, a Jupiter orbiter programmed to fly by Europa multiple times, and a Europa lander, according to Bob Pappalardo, the Europa study scientist at NASA's Jet Propulsion Laboratory. The studies, which are due to NASA Headquarters and Congress in May, are trying to diminish the mission's cost to about $2 billion, including the purchase of a launch vehicle, Pappalardo said. Aerospace Corp. is providing an independent cost estimate of each Europa mission scenario. Pappalardo said the Europa project was close to defining a "sub-flagship" mission to study the moon, which scientists believe harbors a liquid water ocean beneath an icy crust. "The decadal survey is unambiguous in its Mars recommendations in that if the Mars 2018 [mission] does not go forward, there would be no Mars mission, and that we would move to the No. 2 mission, which is a descoped [Europa mission]," Pappalardo said in Thursday's subcommittee teleconference. "We have been working very hard in the past year to descope [the Europa mission]. We've done so very successfully. We have a multiple flyby mission option, for example, which will come in at the cost target that we've been given by NASA, and I want to understand why NASA is abandoning the decadal recommendation." Green responded by saying there were simply no funds projected in NASA's budget to pay for any multi-billion-dollar planetary probes. "Until those [Europa] studies show there is something that can be done with new funds appropriated from Congress, then we cannot announce the next flagship is Europa," Green said. "That's just not possible." Bill McKinnon, a planetary scientist from Washington University in St. Louis, noted the planned end-of-mission crashes of NASA's Cassini and Juno orbiters into Saturn and Jupiter in 2017 could spell the end of the outer planets program. "This is a going out of business scenario for the outer planets, and a loss of a great heritage from the Voyagers, Galileo and Cassini, and I hope that this does not come to pass," McKinnon said. The European Space Agency is considering its own mission to Jupiter. Known by the acronym JUICE, which stands for the Jupiter Icy Moons Explorer, the project is one of three proposals under consideration by ESA, which plans to select a mission for implementation in April. Like its competitors, which include an X-ray astrophysics telescope and a gravitational wave observatory, JUICE is cost-capped at about 1 billion euros, or $1.3 billion, for a scheduled liftoff in the early 2020s. 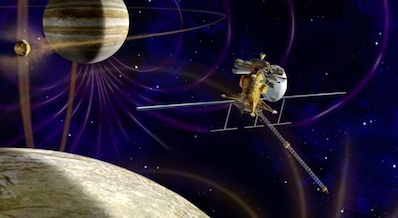 Other outer planets flagships on NASA's mission menu include orbiters to Uranus and Saturn's moon Enceladus, but the decadal survey ranked them lower than the Mars sample caching rover and the Europa orbiter. The fiscal 2013 budget request provides less money for planetary science than even the most pessmistic funding profile considered by last year's decadal survey report. If NASA was presented with a more austere budget, scientists said the agency should preserve its line of smaller Discovery and New Frontiers solar system probes. "It is also possible that the budget picture could be less favorable than the committee has assumed," the decadal report said. "If cuts to the program are necessary, the first approach should be descoping or delaying flagship missions. Changes to the New Frontiers or Discovery programs should be considered only if adjustments to flagship missions cannot solve the problem." The Discovery and New Frontiers missions are currently cost-capped at $425 million and $1 billion, exclusive and inclusive of a launch vehicle, respectively. The cost caps are in the process of being raised for new selections. The decadal survey urged NASA to ensure the selection of new Discovery-class missions every 24 months. Under the current budget request, Green said selection of another Discovery probe will not begin until fiscal year 2015, later than previously announced. The delay means there will be about 54 months between Discovery mission selections, more than twice the gap recommended. NASA expects to announce the next Discovery mission this summer, choosing between three finalists, which include a comet-hopping spacecraft, a Mars lander to study the red planet's interior, and a boat to float in a methane-ethane sea on Saturn's moon Titan. The subsequent Discovery mission will probably launch some time after 2020. The decadal survey also tasked NASA to select two New Frontiers missions between 2013 and 2022. Green said the agency is on track to pick the fourth New Frontiers probe in 2016 for launch in 2023. The timing of a follow-on New Frontiers project is unclear. Another high-priority decadal survey recommendation was to maintain research, analysis and technology development programs within NASA's planetary division. The program's overall research budget is up in fiscal 2013, but there are reductions in technology funding. "Planetary science has a lower priority within NASA than it had in the past," Green said. "Maybe, in a few years, planetary can begin to take advantage of a recovered economy."